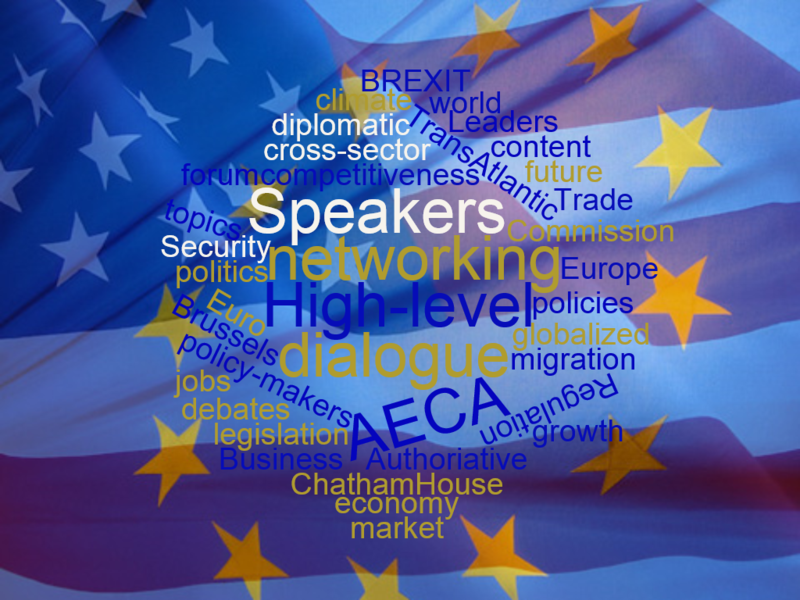 The American European Community Association (AECA) was established in Belgium in 1985 to promote cooperation between business people and other decision-makers from both sides of the Atlantic notably with the support of Roy Jenkins, President of the European Commission, and Leo Tindemans, MEP and former Prime Minister of Belgium. Its purpose remains that of bringing Europeans and Americans together to face the pressing issues of the day in an open and constructive manner. Twice per month, we organize high-level conference-luncheons with keynote speakers that typically are European Commissioners, Director Generals, Ambassadors, Ministers and CEOs, providing our members with unique opportunities to engage in meaningful dialogues. High quality has always been the hallmark of AECA’s programme of round-table debates, as evidenced by the very highest-level speakers that our forum attracts. Over the years, the scope of interest of the association has extended well beyond the TransAtlantic relationship to the global scene. The association continues to attract new members, who find that the quality debates on key policy issues with speakers who are leaders in their field, and the access to high-level networking opportunities, add real value for them and their organisations. The transatlantic economy is the largest and wealthiest market in the world, accounting for one-third of world GDP (in terms of purchasing power) and half of total global personal consumption. The transatlantic economy generates $5.5 trillion in total commercial sales a year and employs up to 15 million workers in mutually “onshored” jobs on both sides of the Atlantic. No two other regions in the world are as deeply integrated as the U.S. and Europe and no economic relationship is bigger than the U.S.’s with Europe. David McAllister, Chair of the Committee on Foreign Affairs & Member of the Delegation for relations with the U.S., European Parliament "As a supporter of international cooperation and understanding, the AECA is an important platform for dialogue and exchange. There are many tasks and challenges, the United States and the European Union can only solve together. And there will be new ones. Therefore the AECA supports a close cooperation, as it recognizes the challenges of today and brings it on the agenda."